Collaborative Leadership Center - BrainstormOverload - Small design studio. Big ideas. 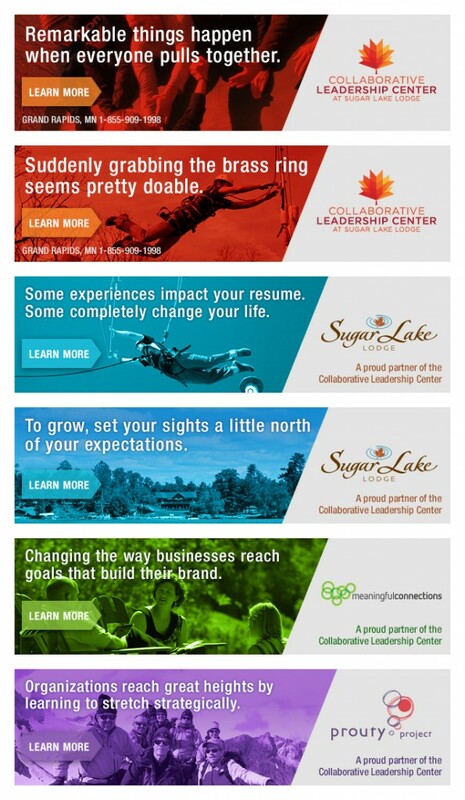 Sugar Lake Lodge has long played host to teams looking for a special corporate retreat. A new partnership has been formed that includes The Prouty Project, Meaningful Connections and others who help build high performance teams. The new entity has been dubbed the Collaborative Leadership Center and we are pleased to have been asked to collaborate on a new logo, newsletter, brochure and banner ad campaigns. We created banner ad templates that can accommodate all of the partners involved and wrote headlines in keeping with the CLC brand and its partners.